Joseph Mallord William Turner (English, 1775–1851) and John Constable (English, 1776–1837) rose to prominence as landscape artists in early nineteenth-century Britain. Their inspired subjects, their distinctive compositions, and their innovative brushwork combined to elevate a genre traditionally considered less important than history painting and portraiture. Turner and Constable: The Inhabited Landscape, on view at the Clark Art Institute December 15, 2018–March 10, 2019, explores the significance of human figures and the built environment in the landscape, as well as the personal significance of specific places to each artist. The exhibition features more than fifty paintings, drawings and watercolors, prints, and books, a beautiful selection of which are on loan from the Yale Center for British Art and the Chapin Library at Williams College. The works in the show are primarily drawn from the Clark’s Manton Collection of British Art, created by Sir Edwin Manton and given to the Clark by the Manton Art Foundation in 2007. This transformative gift included more than 250 oil paintings, sketches, works on paper, and prints, making the Clark a center for the study of nineteenth-century British Art. 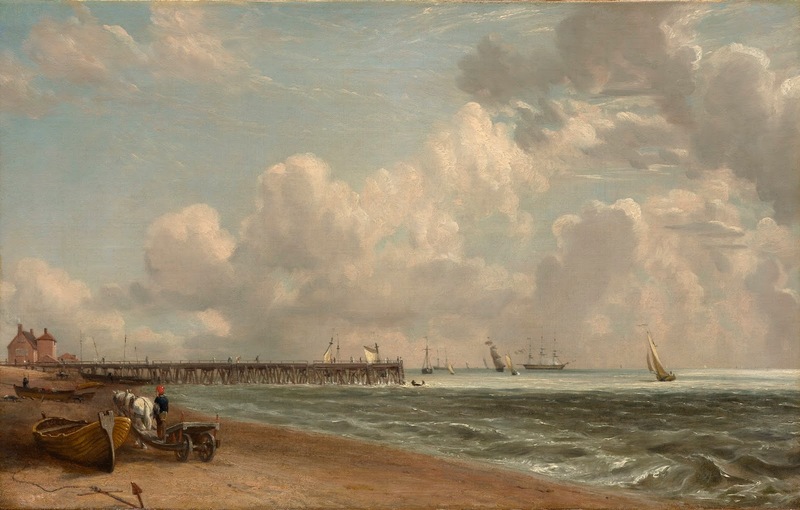 Turner and Constable created a wide range of landscapes and seascapes throughout their careers. They often depicted familiar places that shed light on the personal histories of the artists. Figures incorporated into these landscapes were important to the picture’s narrative and not merely a measure of scale. Constable, having spent his honeymoon in the seaside village of Osmington, recorded this place of personal importance. Osmington Bay (1816) reveals nature’s grandeur on an intimate scale. The figures—including a fisherman mending a net, a shepherd, and a mother with her child—show the beach as a place of both work and leisure. In the painting Osmington Village (1816–17, Yale Center for British Art), smoke billows from the chimney of the vicarage while people make their way by cart or foot along the village lane, conveying both domestic comfort and productivity within the landscape. Laborers—ploughmen, shepherds, laundresses, fishermen, sailors—populate many of Constable’s and Turner’s landscapes and seascapes. The workers’ presence animates the natural world and underscores the potential abundance of the land or sea. Contemporary accounts reveal difficult working conditions and the extreme poverty of agricultural workers, conditions often not apparent in the artists’ portrayals. The laborers’ presence invites the observer to consider how the environment shaped them, and how they influenced their surroundings. The ways in which Turner and Constable rendered laborers within their landscapes may also shed light on how they viewed the workers. 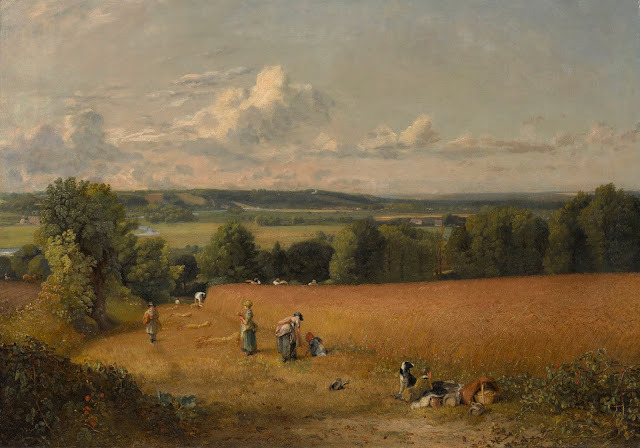 The Wheat Field (1816) presents a view across a valley in Constable’s native Suffolk. Harvesters cut down the golden wheat with scythes, reapers bundle the stalks, and gleaners collect leftover grains while a boy and his dog guard lunch. The idealized scene belies the heat of the sun and the long hours of monotonous and sometimes painful work. Constable’s inclusion of different classes working together suggests that commercial success and charity were not mutually exclusive. This sympathetic treatment of the poor came at a time when the landless classes were increasingly denied access to places that they had traditionally used to grow food or graze animals. 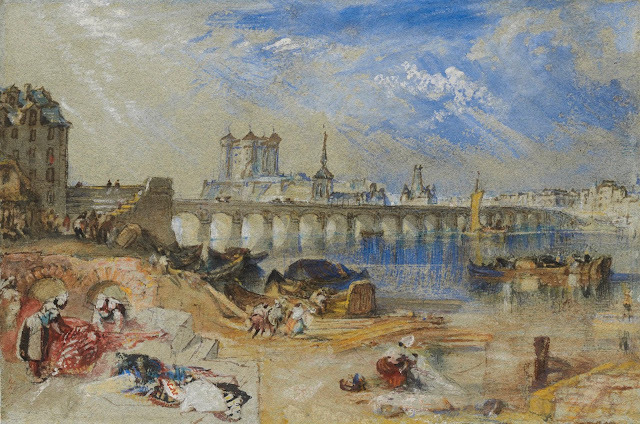 Laborers fill the foreground in Turner’s Saumur from the Île d'Offart, with the Pont Cessart and the Château in the Distance (c. 1830). In this scene of the town of Saumur, located on the Loire River in west central France, washerwomen spread out laundry to dry on the steps while men load cargo onto barges. The workers bring the picturesque view to life, showing the town as a center of commercial prosperity. 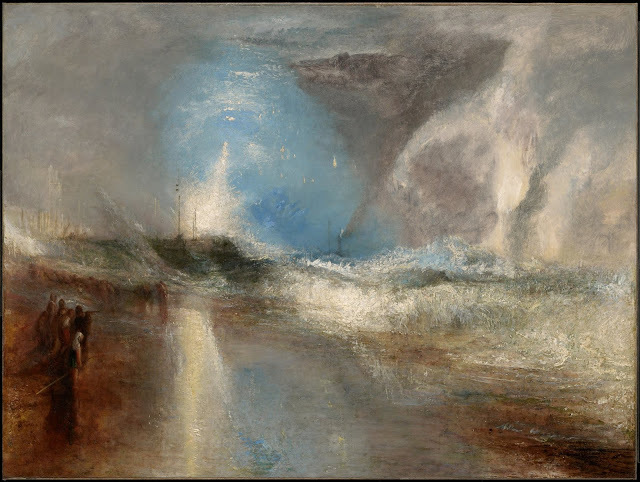 Turner often turned to literary texts for source material, situating characters in settings that enhanced their stories or populating imaginary landscapes with familiar narratives. He was commissioned to design illustrations for literary publications, supplying finished watercolors that printmakers would turn into engravings used in bound volumes. Turner spent the summer of 1831 in Scotland, sketching landscapes described in Sir Walter Scott’s poems and novels for a proposed illustrated edition of the author’s works. 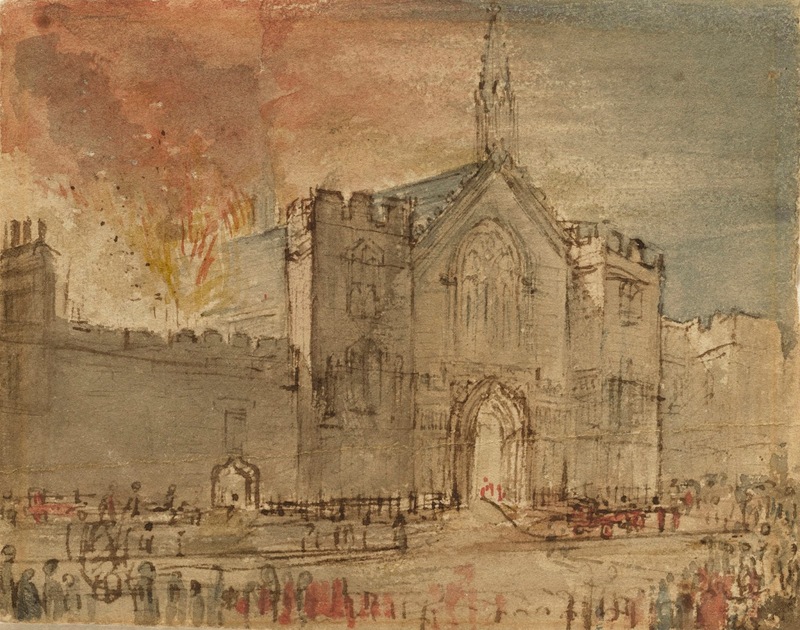 The project never came to fruition, but Turner worked up his drawings for a related publication. Wolf's Hope, Eyemouth (c. 1835) is one of six finished watercolors translated into illustrations for Rev. George Wright’s Landscape-Historical Illustrations of Scotland and the Waverly Novels (1836). Wolf’s Hope, Eyemouth illustrates one of the settings in Sir Walter Scott’s novel The Bride of Lammermoor (1819), showing the harbor town where the novel’s tragic hero, Edgar Ravenswood, resided in a dilapidated castle called Wolf’s Crag. The buildings within Constable’s and Turner’s works not only identify the geography and place their landscapes within time, but also reveal each artist’s personal connections to place. 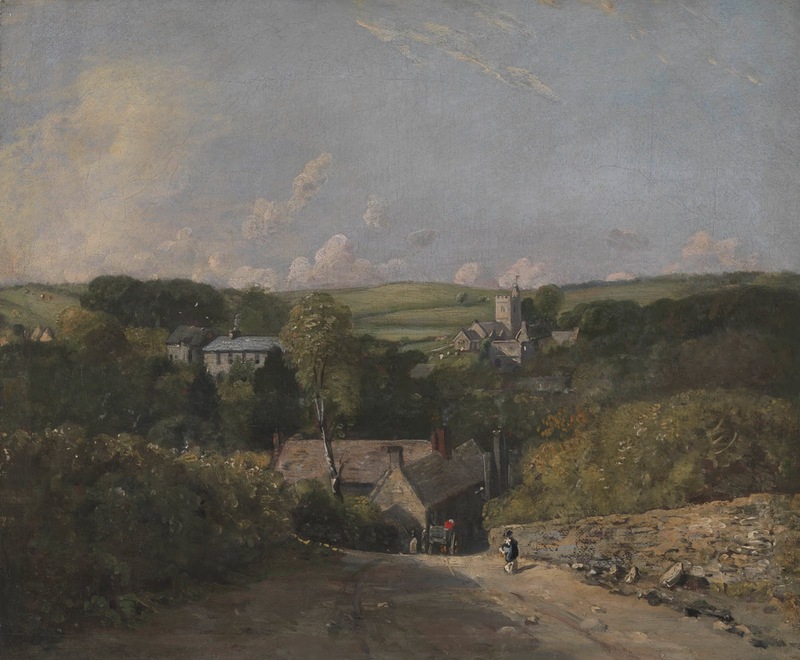 Constable found inspiration in the English countryside, often highlighting the small villages, cottages, churches, cathedrals, and other built structures that he encountered. 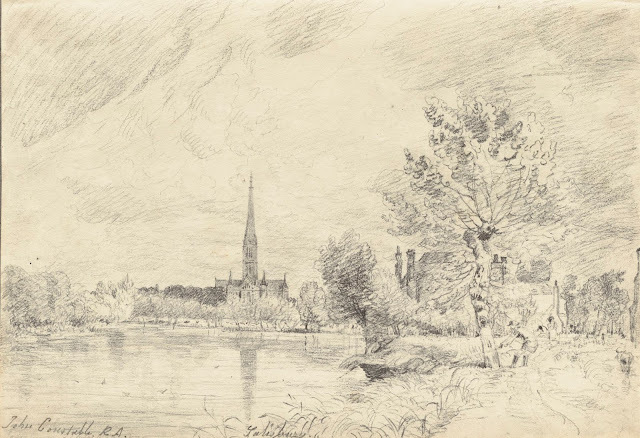 Salisbury Cathedral and its environs held special meaning for Constable, as his good friends and patrons the Bishop of Salisbury John Fisher and his nephew, John Fisher, later Archdeacon of Berkshire, resided there. Inspired by the majestic gothic cathedral, he painted this important seat of the Anglican faith from many viewpoints, often emphasizing the spire towering over the plain. 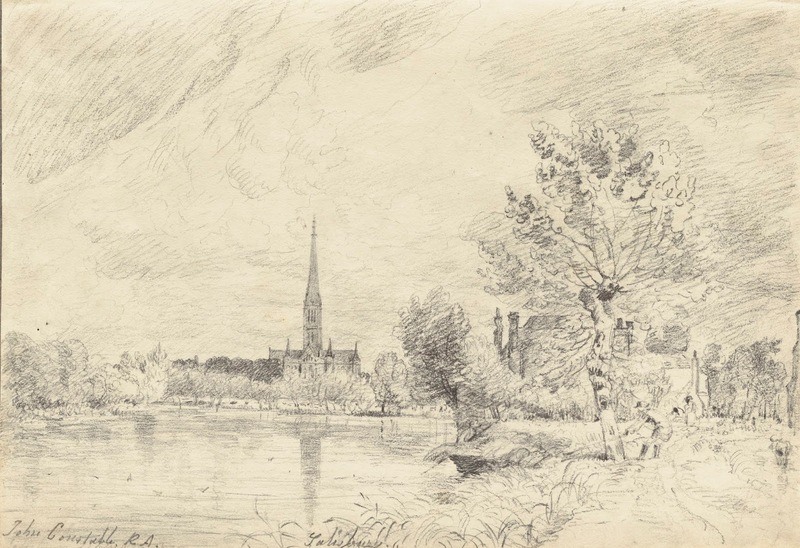 For Constable, a member of the Church of England, the church was not just architecture or a relic of the past, but a symbol of enduring faith. Indeed, as a seat of Anglican worship, Salisbury represented steadfastness and tradition in a time of increasing challenges to its authority, including the rise of Evangelicalism and the revival of Anglo-Catholicism brought on by the Oxford movement in the mid-1830s. The exhibition presents four works in various media depicting the cathedral—three from the Manton Collection of British Art and a fourth collected by Sterling and Francine Clark in 1945. 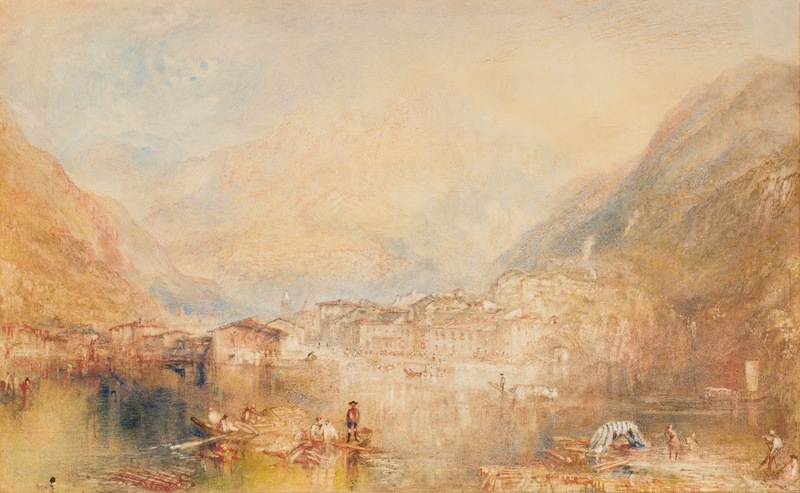 Turner grew up in London, and the city provided him with his earliest subjects. 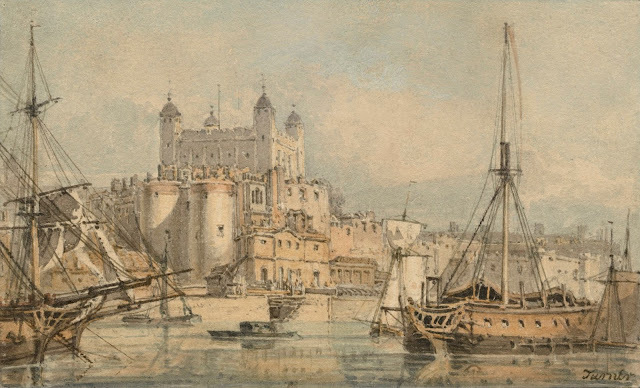 His watercolor The Tower of London (c. 1794) served as the basis for an engraving published in The Pocket Magazine on January 1, 1795. Viewed from across the Thames, the White Tower, built in 1078 and famously used as a prison until 1952, rises majestically above a city awash with light. Large mast ships on either side of the small composition frame the view of this historic fortress. The still water of the Thames reflects the boats and buildings, giving the scene a timeless calm. The absence of figures and narrative allows the focus to remain on the built environment. 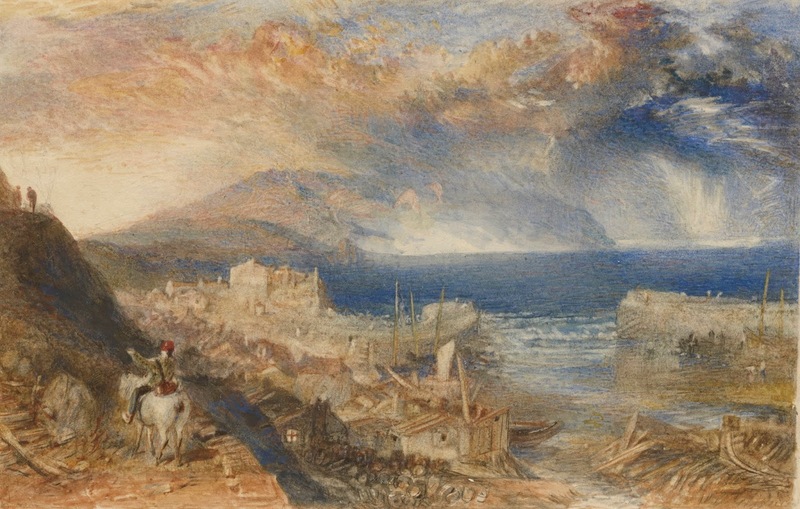 Turner and Constable: The Inhabited Landscape is presented in the Clark’s special exhibition galleries in the Clark Center. The Clark will present a companion installation of sixteen landscape drawings by Thomas Gainsborough in the Manton Gallery for British Art, located in the Manton Research Center, from December 1, 2018–March 17, 2019. Fourteen of the Gainsborough drawings on view in this installation are from the Manton collection. Though recognized as one of the most fashionable portrait painters in the eighteenth century, Gainsborough made hundreds of drawings of the English landscape. Abundant with foliage, cottages, and pastoral figures, the works evoke the gentle woodland and heath of the artist’s native Suffolk and the mountainous Lake District of Cumbria. Gainsborough’s landscape drawings in this presentation reveal the artist’s fascination with mixed-media technique: graphite, chalks, ink washes, watercolor, and oil paints intermingle on toned papers. The Manton Collection of British Art is considered one of the greatest collections of British art assembled in the last fifty years. 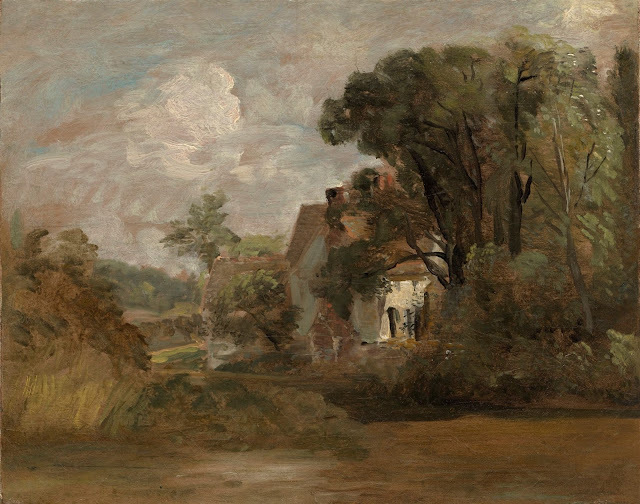 Highlights of the collection include John Constable’s contemplative views of the English countryside and strikingly naturalistic oil studies; Joseph Mallord William Turner’s turbulent, quasi-abstract seascapes; Thomas Gainsborough’s rigorous chalk drawings; and Thomas Rowlandson’s humorous watercolors caricaturing British life. The collection includes more than 300 works and also features great suites of watercolors, drawings, and prints by such artists as Thomas Girtin, Richard Parkes Bonington, Samuel Palmer, John Martin, and William Blake. The collection was created by business leader and arts patron Sir Edwin A. G. Manton (1909–2005) and his wife Florence, Lady Manton (1911–2003), who began collecting in the 1940s. Born in Essex County, just twenty miles from “Constable Country” in the east of England, Sir Edwin arrived in New York in 1933 to help develop the American International Group. Although he spent the remainder of his life in the United States, his love of British art was testimony to his continued devotion to his native country. Sir Edwin was knighted by Queen Elizabeth in 1994 for his generous contributions to the Tate Gallery (now Tate Britain) in London. Throughout his life, his appetite for art collecting never diminished. “I am a compulsive buyer,” he once observed. “It's better than spending your money on bottles of Scotch.” This collection, a gift from the Manton Foundation in 2007, constitutes the most significant addition of art to the Clark since it was founded in 1955 and perfectly complements the Clark’s holdings of nineteenth-century French and American art.